Gastonia, NC finally goes Thai! GASTONIA, NC – Finally, a Thai restaurant in Gastonia, North Carolina! That’s what I thought as I drove down Franklin Blvd. and noticed a large sign that read “Thai House Open Soon” on a storefront in a strip mall. My expectations were not high as I assumed possibly it would be just another take out joint with a smattering of tables so as to call it not a take out but a sit down eatery. So, a week or so passed and the sign now read “OPEN”. Having just eaten, the little wife and I decided to nix the idea of a duo dinner evening so she did her duty and ran inside to fetch a menu for me to scrutinize and add to my ever-growing collection. Alas, we would forgo our Thai House excursion until the next available evening. “How did it look inside?” was my query to her upon her return. “Really nice,” she kindly replied. See the decor and menu HERE! So far, so good – it’s already above my expectations. We were promptly greeted and seated at a very sturdy hardwood table – I dislike flimsy hardwood tables – near the sushi bar (which I will review thoroughly at a later date). Several, not one or two, but several very pleasant Thai ladies and gentlemen greeted us and bowed traditionally and we began to peruse our carte du jour offerings. Not being overly ambitious on this initial outing, I opted for an appetizer bowl of shrimp Tom Yum, a traditional Thai slightly hot and sour soup – note slightly (as in, more broth-y), not akin, but related to your traditional Chinese take out hot and sour soup. Quite delightful. Four large shrimp (perhaps prawns) with shells on (albeit with little flavor) was a perfect compliment to but not overbearing seafood addition to a wonderful broth with mushroom, tomato chunks, lemongrass and a hint of lime. 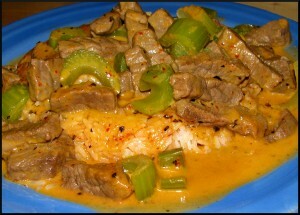 For an entree, I chose my favorite staple – red curry beef. A good red curry will hasten my return to further my excursion into the depths of the menu on forthcoming visits. I ordered mine “4” as a 1-5 scale reference to the heat and spiciness of the dish. “Ooooh, you like spicy!” our order taker vociferated. I nodded.Although she expressed desire for a rice dish on the way to Thai House, the little wife ordered Pad-See-Ewe – a soy-sauced noodle dish with broccoli and egg with her choice of pork. She ordered “0” as she is anti-spicy. Actually, more of the pro-bland right in my opinion, but that’s another story. Her order arrived (mistakenly given to me) as my Tom Yum was merely half-finished. My red curry soon followed and proper placement of the entrees preceded apologies and more bows. Good, I thought while my taste buds were rejoicing blissfully – it won’t be a problem getting her to come back here soon. The curry was delectable, delightful and delicious. Thumbs up all the way around. A perfect 4 on the Heat-O-Meter – room for a nice 5 next time. Lots of meat on both entrees – nothing skimped. The creamy, rich, savory curry was exquisite. Got me on a kick of recreating the dish at home for the past three nights! And yes, to please the little one we did order the dessert special – she loves her coconut. The sticky rice and mango was excellent and we both agreed we should’ve gotten one for each of us instead of sharing one. Not that the portion was small, but that it was so good! Congrats to Thai House of Gastonia – highly recommended! Until we return to sample more Thai fare delights, the Zojirushi and I will be working overtime! Bon appetite! Or, I should say, ทานให้อร่อยนะ!